Screen zoom is a useful feature of Mac OS X that zooms into the screen where ever the cursor is located, making it easier to see parts of the screen, examine pixels, read small fonts, and perform other functions with greater visual clarity. 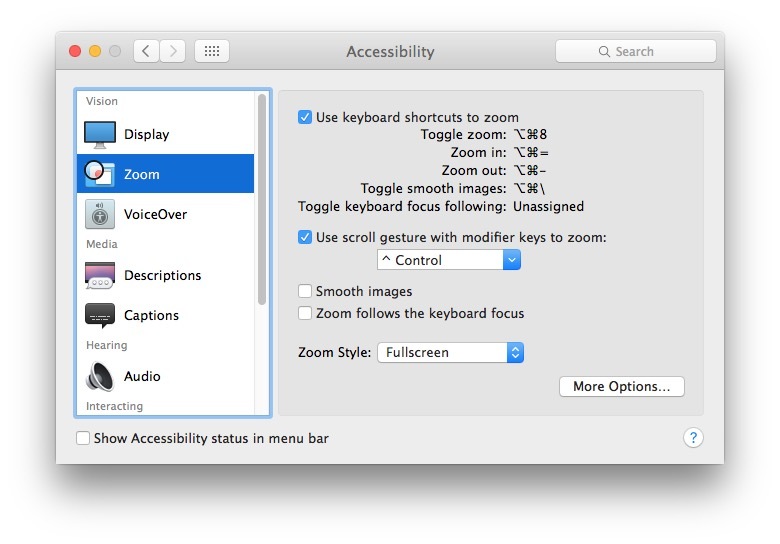 The zoom feature was enabled by default in some earlier versions of Mac OS X whenever the control key was held down, but in modern versions of Mac OS X, the screen zoom feature has been turned off by default, and is now a feature of Accessibility settings. The Screen Zoom feature is an accessibility feature aimed at making it easier to read certain screen elements. Accessibility is sometimes called Universal Access, depending on the version of Mac OS X on the computer. We’ll show you how to enable the Screen Zoom option on any Mac with any version of OS X System Software. For trackpads, scrolling is achieved with two fingers gesturing up or down, with a mouse it’s simply the scrollwheel in either direction, with both you need to hold down the Control key to access. Just like other versions of Mac OS X, you can still toggle anti-aliasing on and off within the Zoom feature by hitting Command+Option+/. Remember, screen zoom is enabled by default in earlier versions of Mac OS X, just hold down the Control button and zoom with the mouse wheel or trackpad, just like it works in modern versions of Mac OS once it has been enabled. Finally! I thought they had pulled this feature out of Lion completely. Confusion is caused by adjusting settings after habits have become established. I question why Apple developers made the decision to disable such a function, causing one to dig for the solution. I don’t know why but I seem to be able zoom in and out using the ctrl and two finger trackpad gesture or scroll wheel without turning Zoom on, although it needs to be on for the Zoom with Keyboard options to work. That is because in settings in the Zoom Pane under the options tab you have checked the last option that controls zooming with mouse or trackpad. This works irrespective you turn Zoom on or off :) Hope this helps!! Spot on. Thanks for that. I wonder why the article didn’t mention that? A case of Apple giving us too many options? It works with my trackpad and mouse. when I enable it, it zooms in automatically and I can’t either zoom in or out. already tried pressing control or cmd + scroll. can someone help me? Thanks so much! Very helpful! I was frustrated I couldn’t use the zoom feature like I had on my old mac. Now it works great!